As an extension of our Top 40 in Review series, we are featuring the seven players who were ranked in the SoxProspects.com Top 40 during the 2015 season and graduated from prospect status. All entries in this year's Top 40 Season in Review series can be found here. Season in Review: Ever since being drafted with the 26th overall pick in 2011, Blake Swihart’s stock has been on the rise. He has only ever known the top 10 in the SoxProspects rankings and has slowly crept up through those ranks, eventually landing at the top of the rankings at the end of the 2014 season. While he struggled during his short, 18-game stint at Pawtucket to end 2014, he began 2015 on fire. He hit .338/.392/.382 over his first 18 games, showing he was capable of holding more than his own at the level despite being almost four years younger than the average Triple-A position player. Along the way, he collected Player of the Week honors for the first full week of the season, April 13-19, when he had 12 hits in 25 at-bats (.480 average) and hit safely in each game he played. His stay in Pawtucket would be short since a need arose at the major league level when Ryan Hanigan suffered a displaced fracture in his knuckle, requiring significant recovery time. With fellow catcher Christian Vazquez already having undergone Tommy John surgery in spring training, there were no other long-term options available to the Red Sox and they decided to turn the job over to the 23-year-old. He struggled at first and only hit .241/.279/.323 with just seven walks to 36 strikeouts across 38 games. Even during his eight-game hit streak from May 22-29, when he hit .321, he did so without any power as all of his hits came as singles. Scouting Report and 2016 Outlook: Listed at 6-foot-1, 205 pounds, Blake Swihart has filled out considerably since he entered the organization. The change in Swihart’s build is especially noticeable in his lower half and he has gotten much stronger during his five years as a professional without losing any athleticism. At the plate, Swihart got off to a slow start in the big leagues but made significant strides as the season went on and is already showing the potential to be an above-average offensive catcher. 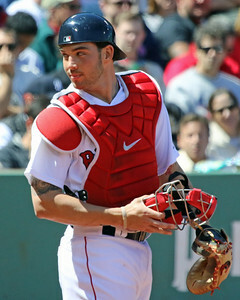 A switch hitter, Swihart has a fluid, line drive stroke. He has plus bat speed, strong bat control and a solid knowledge of the strike zone. While his approach at the big league level still needs some refinement, he showed strong contact skills and the ability to use all fields. Swihart is currently a better hitter from the left side of the plate, showing notable platoon splits, albeit in only 90 at-bats from the right side. He didn’t show much power in 2015, but he does have average to above-average power potential, but it wouldn’t be a surprise for it to take a few years to develop. Defensively, Swihart was passable in 2015, though he needs to show significant improvement with blocking balls in the dirt and framing pitches. Swihart struggled with keeping the ball in front of him at times in 2015 and his framing numbers placed him in the bottom tier of catchers in the league. Swihart has the physical tools to improve in those areas and, given his age, he should take a step forward in 2016, especially with Christian Vazquez healthy and waiting in the wings. Swihart also has a plus arm and consistently pops sub-2.0 seconds, allowing him to keep base runners honest.